When the Department of Health produced its initial consultation document for the Medical Innovation Bill (the Saatchi Bill), they included a graph that showed the rising cost of clinical negligence payments made by the NHS over the past few years (about £1.24bn in 2012/3). They did not include any analysis to show what proportion of that sum covered straightforward negligence (leaving a swab inside a patient post-op, amputating the wrong limb, giving the wrong dose of a drug, that sort of thing) and what proportion was from situations where doctors had innovated, and then were later sued. This is a shame, because knowing the true cost of litigation due to innovation would have been an important piece of evidence to justify the bill. Also, there would be a risk that the casual observer might not realise that most – perhaps all – litigation is because of claimed poor practice, not for innovation, and accidentally draw a link between that £1.24bn sum and the risk of innovating doctors being sued. That casual observer might mistakenly use this as a reason to think the bill is a good idea. 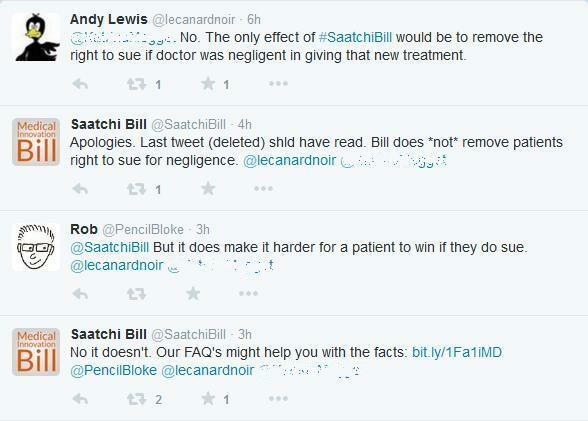 The Saatchi campaign has been – shall we say – contradictory in its presentation of the effect the bill will have on the ability of patients to sue for negligence. While claiming it doesn’t alter patients’ ability to sue, promoters also say that it protects doctors from being sued. I’ve already examined that in some detail here, so now I’ll look at what might happen in a negligence claim and how the bill appears to distort it. This category covers treatments that would fall outside Bolam/Bolitho – treatments that have no support from colleagues and/or no logical basis for why they would work. If a doctor proposes a treatment that has support from a responsible body of colleagues and a logical basis, they have no need of the bill – their proposed treatment would be Category B. No, this new category covers treatments that have no support or logical basis, because that is what the bill aims to allow. Now, ELP has some pretty strong potential side effects – seizures, coma, paralysis, even death, so it needs to be monitored carefully, because an overdose can have serious repercussions. Mr E has just such an overdose, which results in serious, permanent impairment. Mr E believes this is because the doctor didn’t monitor his medication competently, and he sues to recoup the cost of the permanent round-the-clock care he now needs.